“There’s a fine line between tat and vintage,” my friend said, and hoo boy, ain’t that the truth. But the sun was shining and my birthday was coming up, and so, full of optimism, we headed for Winchester’s vintage market. To be honest, there’s just something about the green and white-striped tent tops that calls to the shopaholic in me. In my first year, I would live for the first Sunday of every month, when the vintage market would come out to play. I probably spent a fair chunk of my student loan on upcycled jewellery and retro cardigans. I don’t regret it, but I’ve grown old and cynical, a fact I became all-too-aware of as we looked at the tables covered in what most people would call junk, but some would call treasures. Most of the shopkeepers are chirpy, happy to engage you in conversation. Some are not. Some shout “NO PHOTOS” at you from across the stall. Those lose a sale from me. Not that I’m bitter. It was. And so that’s what I photographed to really encapsulate the spirit of the market. It’s a heavy old thing, the real definition of vintage. In the spirit of nostalgia and slivers of history, it seemed only fitting to make the hike up St Giles’ Hill, which offers a beautiful view of Winchester, and from where we could look at the vintage market from a distance, its stalls and customers as small as ants. Once again, I realise how negative I sound. 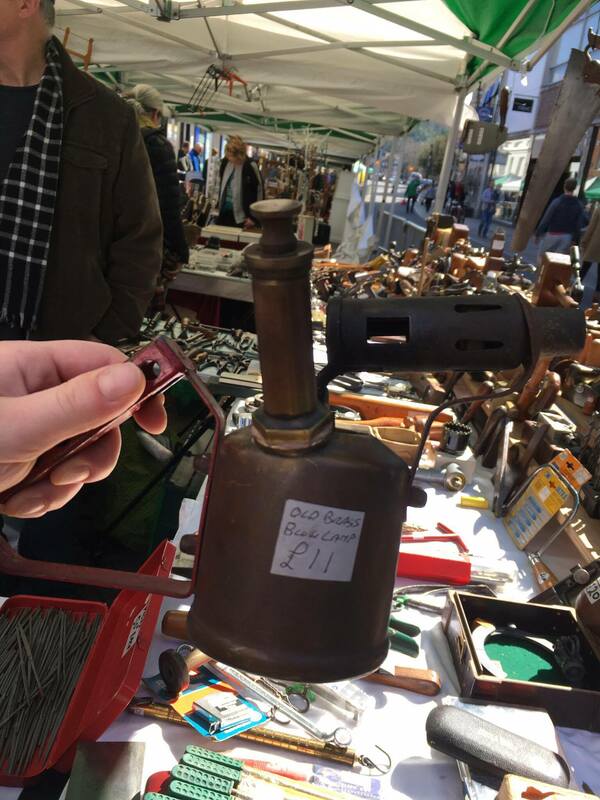 I do love the vintage market – it can be full of wonderful things, though you might have to search harder on some days. All in all, I say ‘go’, folks, but be wise with your money***. * I have the tiny hands of a goblin paired with a giant head. It’s a tragedy. ** “Tenner. Whatever, I’ll do it for five,” is how the one-sided conversation from the vendor went down. *** If any readers are feeling generous, please ask for my Paypal account.